Looking for design ideas for a large outdoor space? 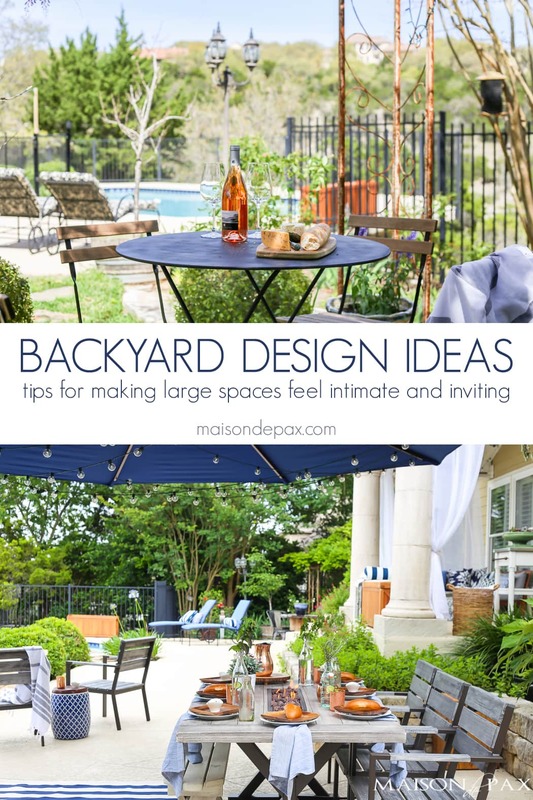 See how these large backyard design ideas can help make a spacious area still feel intimate and inviting. I realize that many people have the opposite problem: trying to make a tiny outdoor space feel larger (and trust me, we’ve lived in apartments with no outdoor space at all, so I know! )… but if you’ve had a large space before, you probably know how challenging it can be to design it well. When we first moved into this home in the Texas hill country, I was kind of at a loss with the backyard. It was lovely (the previous owners were avid gardeners), but around the pool was so. much. concrete. And while the gardens were beautiful and elaborate, there was very little yard space for the kids to play. So I set to work trying to subdivide the space (if you will) by setting up different areas for different purposes. I wanted it all to feel cohesive, but still be inviting to intimate conversation and relaxation. Before I share my tips, I thought you might like to see a tour of the space that I shared on IGTV recently. I’ve included the video below, as well, if you are not on Instagram, but the format is probably easier to see on IG. 1. Designate areas for different purposes. While you may want to choose a cohesive style or color scheme, don’t feel like the entire yard has to be treated as one space. Allow yourself different focal points – places for more comfortable interactions. Consider a dining area, a play area, a conversation area, or a potting bench/gardening area. Once you have created various areas, furnish to scale as much as possible. Do I need a dining table that takes up the entire back patio? No. But a dining table that properly fills our outdoor dining area is perfect. A tiny bistro table would feel rather puny in a space that size. 3. Don’t forget serving areas. If you’re like me, the kitchen counters and island make excellent serving areas inside for casual entertaining… but ants are a real thing, and nobody wants to eat their food off the ground outside. So be sure you consider surfaces to serve from. We have the counter by the grill, but I also added a small wooden potting bench/buffet near the table as well as a stainless steel topped cart near the back door and conversation area. 4. Create shade wherever possible. In central Texas this is especially important. The sea of concrete is not only much more enjoyable but feels less unending when broken up by covers. 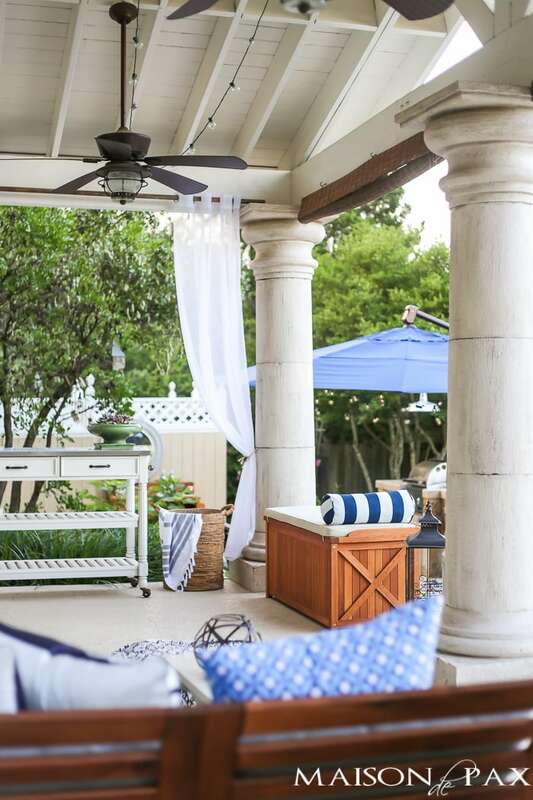 In our yard, it was a matter of our giant umbrella creating a covered outdoor dining space… but you could consider a pergola, an arbor, an umbrella, or other outdoor shade options. Plus once you add a “ceiling” of any sort, it begins to feel like its own little room in a way, which helps to further subdivide the space. 5. 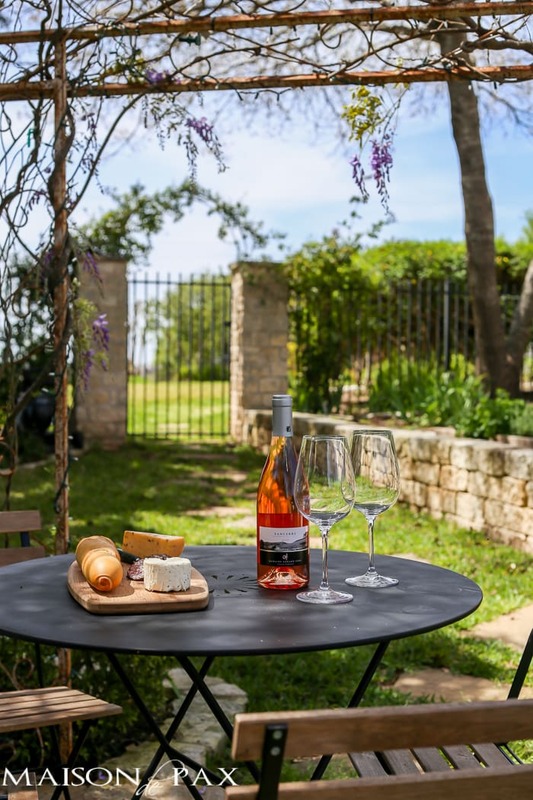 Add a bistro set. Here a set. There a set. Everywhere a set, set. (Can you tell I have toddlers? 😉 ). Really, though, you can’t go wrong with a spot for 2-4 people to sit a spell. Just be sure to tuck it somewhere (don’t try to use it to fill a large space): under an arbor, in the corner of the yard, beneath the shade of a tree, next to a flower bed, wherever. 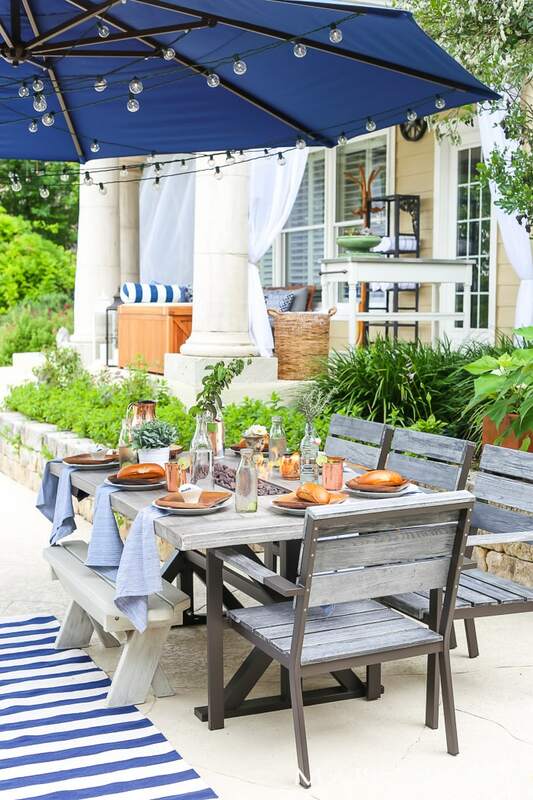 A bistro set is an instant little focal point, invites a European-style appreciation for a slow conversation, and offers an outdoor gathering point for picnics, kids’ lunches, or games. 6. Include storage for outdoor games. You may have noticed our two wooden boxes: one stores outdoor games and one store pool toys. Having those things safely stowed yet easily accessible means they get used regularly by both kids and adults alike. 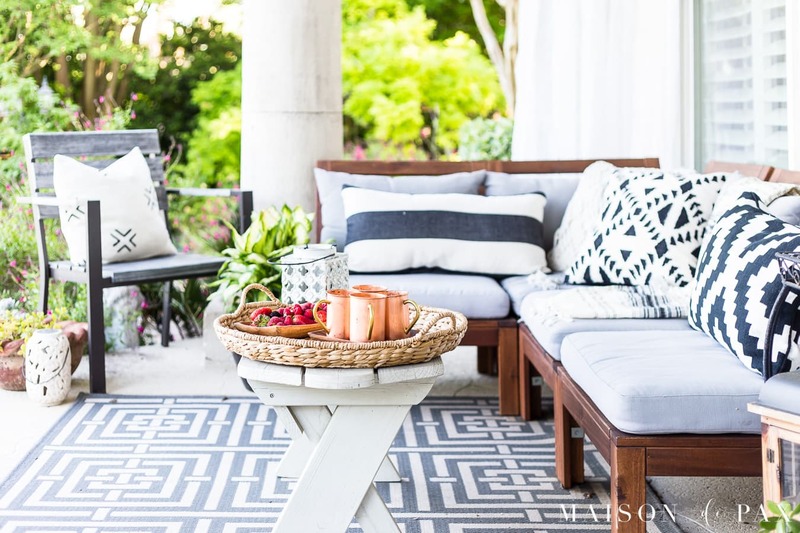 I know it may sound silly, but outdoor fabrics have come so far in recent years… so you might as well. And there is something so very inviting and interior-feeling to having pillows outdoors. I think it naturally adds coziness to each small area, even if the overall space is really large. I hope you found these tips helpful! 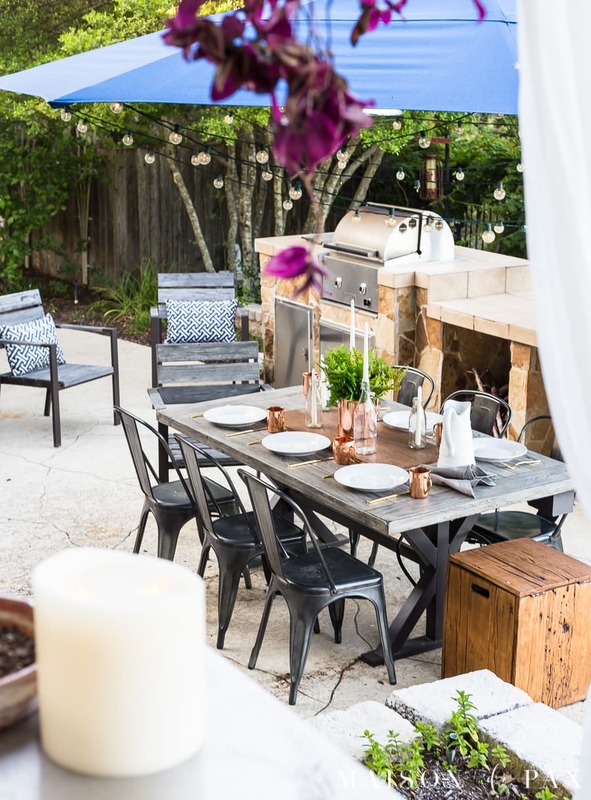 You can see more about our outdoor dining area and our back patio or shop our outdoor areas with my affiliate links below. Beautiful back yard for the family and friends! You’ve made it cozy, kid friendly and perfect for entertaining! Thank you for your kind comment, Pamela! You do have a great outdoor space and looks organized and a nice place to be.I love the way it is safe for your children to play, that’s every important to parents. Yes! Safety is so important! Your backyard is so beautiful. Thanks for all the ideas. You have a stunning backyard. Perfect for parties.